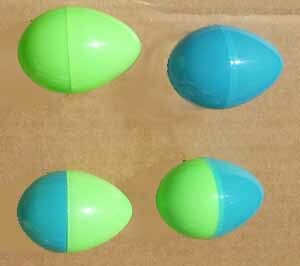 I am going to use these toy eggshells to help try to explain what is happening with tomato genes. Like the two halves of these eggs, genes in tomatoes exist in pairs. 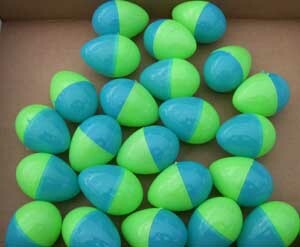 When added together they make a "whole egg" or, in the case of genes, expression of that trait.. When a tomato is consider a line (often called true breeding or open pollinated) the pairs of genes are the same*. 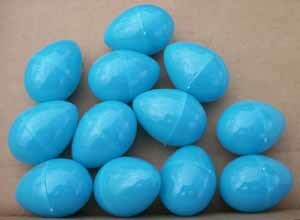 When gene pairs are the same this is called homozygous (think like-egg). This will be a key point through out these pages. Tomato flowers are such that they can and most of the time do pollinate themselves. That is, the ovary of a flower is fertilized by the pollen of that same flower. This kind of breeding system is why it effectively stays uniform. Hopefully I will be able to illustrate this later without being too technical. There is a time when genes in cells are not found in pairs, during reproduction. Reproductive cells are either pollen (male) or an ovule (female) and each will have a 1/2 of the pair. When a true breeding line divides for reproduction, only genes which are the same can be contributed. So the line's offspring remains true to it's parent and all plants look the same for that specific gene (uniform). Genes can have different forms. For simple inherited genes, there exist two possibilities, a dominant one and a recessive one. Let's use the example of the gene for leaf form. 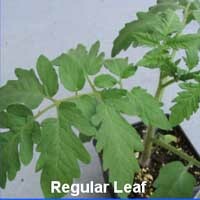 There are regular leafs and potato leafs forms. One can think of each image below as a packet of tomato seed representing a variety that expresses the two different forms of leaves. 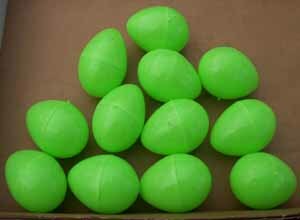 What happens to the eggs when we cross a dominant regular leaf with a recessive potato leaf? Select one plant to to be male and another female. Such a cross is reciprocal in that it doesn't matter which you chose for the male or female. In this example below, the recessive is male and the dominant is female. So what would that resulting seed packet look like? All the pairs become mixed. This is called a F1 hybrid. It's genes are referred to as a heterozygous population. The entire population is completely uniform. So what does the hybrid's leaf of such a cross look like? It comes out a regular leaf. This is because the regular leaf gene dominates over the expression of the potato leaf gene (recessive). Recessive traits are only expressed when their genes matches. 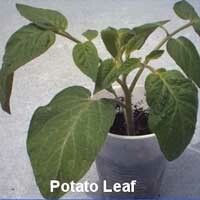 a potato leaf self-pollinating or crossing with another potato leaf variety will produce a potato leaf plant. a recessive self-pollinating or crossing with a similar recessive will only produce recessives.